Three Days to go. Feeling kinda Low. According to the side effects information we received at the travel clinic, we are utterly boring and predictable as today my beloved Grumpy and I were both feeling a bit flat, presumably from the yellow fever shots. Not a bad thing! We spent the day on bed rest and he did his usual brainiac Internet surfing stuff and probably got some work done as well. Not sure though, as I was asleep for a good chunk of the afternoon. Popped in to see my cousins who are up at the Matakana house chilling out and communing with nature. Very sad about the thought of them leaving, and think it is a shame that we are heading out in the middle of their Antipodean adventure, as I’ve been scheming for nearly two decades to get them to come down to our little island paradise, and it really is a huge joy to have them here. I hope they will be back. I now know where Bestie and his family are staying and it just happens to be the same hotel as mother in law so that will be easy. We’ll try and book ourselves into the same hotel for the night before embarkation. See how organised I am? Awe inspiring really isn’t it? One of the superheroes from yesterday’s meeting has also been working in the NGO and Not For Profit sectors forever, so he’s magicked up some amazing contacts dotted around South America for us. Having like minded locals to show us around in their own back yards and learn about all the amazing things they are doing, well the idea is just plain heaven! I wish I was kidding, but due to the not-so-conventional upbringing these children have been privy to, they do not see travel as a treat but as something to be endured. Luckily, I also know that they always have an amazing time once they are on the road (as long as they are not lugged around on the music industry trade show circuit, they’re totally over that circus). So once I post this I will get up and dust off the suitcases that have not been packed for… Oh, it must be several weeks now at least since our last overseas sojourn… and into those suitcases I will pack good red wine, lovely NZ chocolate and some manuka honey as gifts for the people we’ll see in California before we embark on the ship. I’ll also strongly consider packing for Steve and myself and probably find something far more useful and interesting to do with whatever waking time I have. There is a beautiful full moon out in the sky tonight, and there was a lovely sunset. The weather is going to turn bad for the weekend, which is fine as we have plenty of room inside for children to entertain themselves and grown ups to mingle on Friday evening. 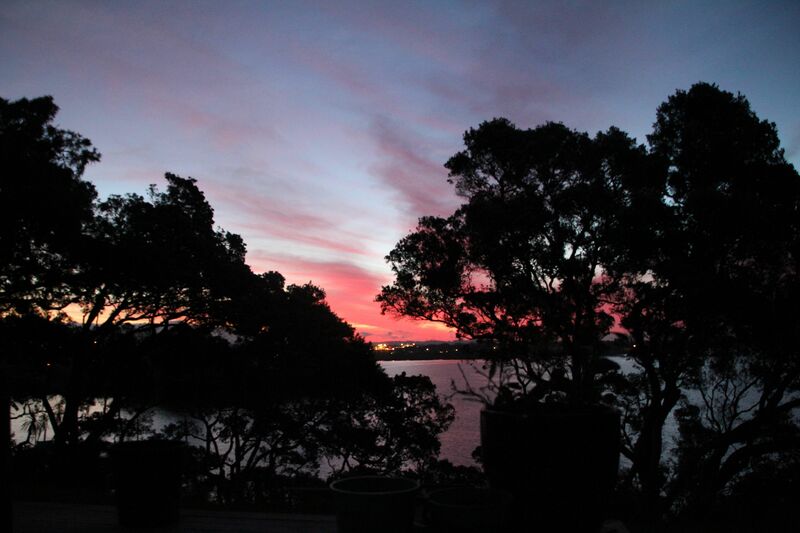 I’ll leave you with a picture of the sunset over Hobsonville airfield from our front porch this evening.